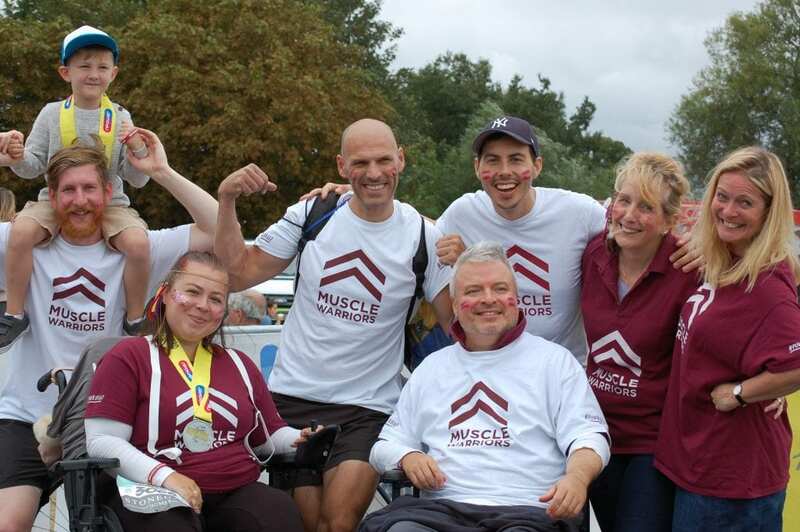 Multi award-winning family charity, the Muscle Help Foundation, is thrilled to announce that three teams of fundraisers successfully completed a Superhero Tri, raising more than £5,000 for the charity’s Muscle Dreams activities. 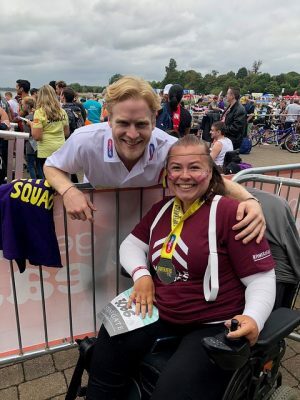 The Muscle Warriors, including the charity’s very own CEO and founder Michael McGrath, gathered on Dorney Lake on August 18th for the second annual Superhero Tri, where they completed a 400m swim, 10km cycle and 2.5km run. In what was one of his biggest physical challenges since becoming the first disabled person to reach the North and South Poles, McGrath completed the triathlon with the help of former Team GB rower Toby Garbett and charity volunteers George Harris and Jake Kanter. McGrath, who himself lives with MD and is a full-time powerchair user, was slowly lifted into a dinghy and stabilised by his son-in-law Jake Kanter who remained with him. Toby and George swam their hearts out, pulling Michael and Jake the required 400m swim distance. After the transition, Michael was then cycled 10km on a Quest 88 Draisin Bliss platform bike. 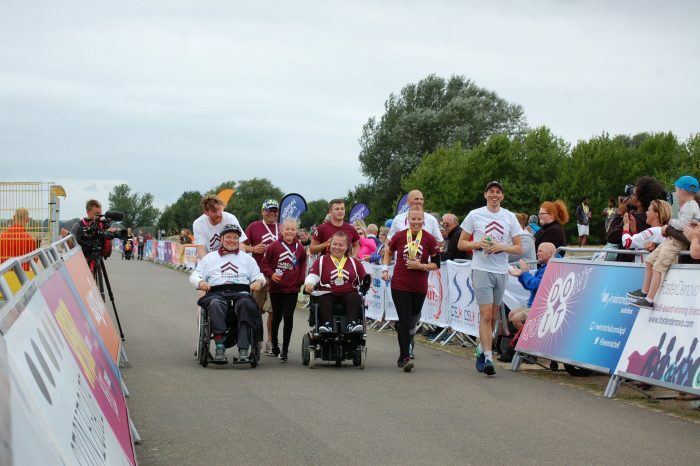 He completed the final leg of the challenge in his manual wheelchair, crossing the finish line with members of the other two teams competing for the charity on the day. 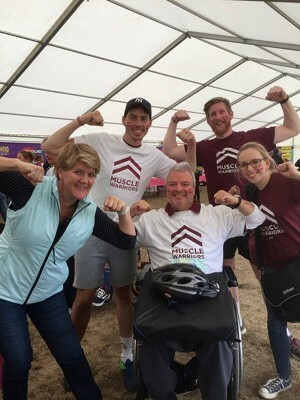 They included a group called ‘Muscle Dream Team‘ led by MHF Ambassador Leah Booth accompanied by Steve Torricelli, his son Dan and service provider and charity volunteer Dawn-Louise Kerr. The final group ‘Team Limitless’ comprised Niamh Duffy, Elouise Mullen, Jake Weldon and Sarah Neads from Limitless Travel, whose CEO Angus Drummond has Limb Girdle Muscular Dystrophy (LGMD 2A), coincidentally exactly the same genetic type of MD as the charity’s CEO. The teams raised their voices and their arms in many a Muscle Warrior rallying cry and salute, which has become a visible symbol of hope, courage, strength and unity for all those with Muscular Dystrophy around the UK. Channel 4 presenter Clare Balding (pictured below left with some of the team members), Paralympic legend Jonnie Peacock (pictured below with MHF Ambassador and team member Leah Booth), British wheelchair basketball player Freya Levy and ‘Last Leg’ presenter Adam Hills met team members, all flexing their sporting muscles in support of the charity. All three teams smashed their targets of raising £657: a significant number, as 657 is the total number of muscles in the human body and also the charity’s Muscle Dream goal. As of August this year, 281 Muscle Dreams have been fulfilled, leaving 376 to go before the magical 657 is achieved. 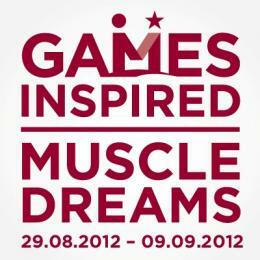 The £5000 raised will go towards funding up to four more Muscle Dreams. “Our thoughts have now turned to next year’s Superhero Tri event!  The charity is looking to recruit more teams, so if you would like to get involved and can commit to raising £657 for the charity in this fun, fully-inclusive, fundraising initiative, ping an email to: hello657@musclehelp.com. As we say in the charity, that’s the #powerof657,” added McGrath. Click HERE to see photos on MHF’s dedicated Flickr Photo Channel.